“Look at the road you’re standing in”, says 27-year-old Yusuf Toefy. “You see barber shops, you see fish and chips eateries, you see clothing stores. Now remember how this place looks and come back in a few years’ time. This road is not going to look the same”. From this pavement in bustling Malta Road in Salt River, where Toefy lives, there are barber shops, fisheries, and the fabric stores. But beyond the shops and houses there is also a community. This is the type of neighbourhood where businesses know each other as neighbours do, and call their customers friends and family. 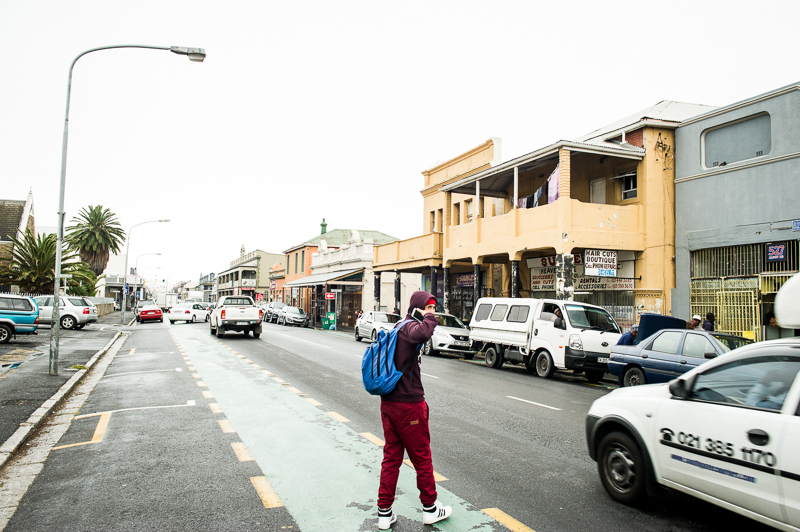 Indeed, while the story of gentrification in Woodstock is regularly told, it is gentrification’s slow creep into neighbouring suburbs like Salt River that is yet to be fully unpacked. In a country whose progress is defined by its ability to rewrite a history of racial exclusivity, the notion that some neighbourhoods are experiencing displacement along racial lines by way of rent hikes and forced evictions is an emotive one. In the Western Cape, Woodstock has been the poster child for such expositions. The transition of a historically racially mixed area, whose identity survived the apartheid Group Areas Act, to one whose cultural identity has been lost in a post-apartheid era, is not without a sense of irony. Its gentrification has seen an erosion of community and culture. It shows no signs of slowing. Salt River, lying right next to its neighbour Woodstock, is in a seemingly precarious position. 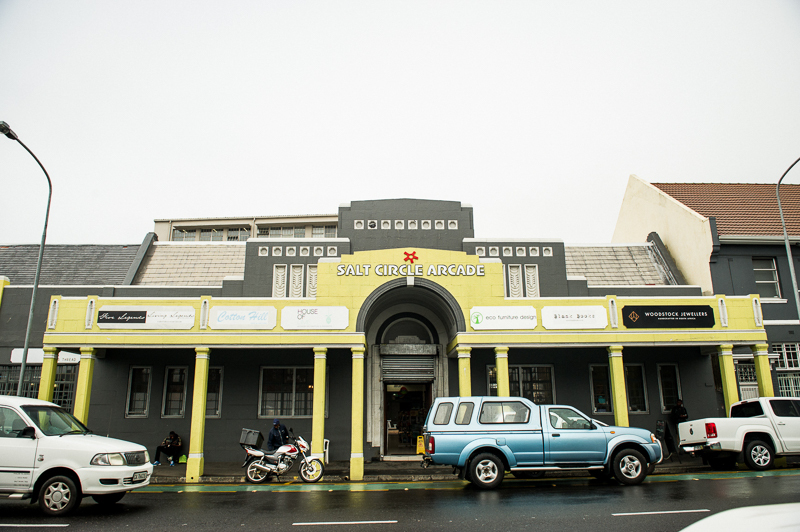 Salt River shares a proximity to the CBD and low-income residents – conditions that made Woodstock ripe for gentrification. It shares the potential to suffer a similar fate. For the most part, this story is true. Urban renewal – or gentrification, as it is commonly known – refers to a renewal from the vantage point of commerce. But it also refers to a ‘racial renewal’; one where black, low-income communities are gradually replaced by a wealthier, usually whiter community. Here, economic change begets social change, and as homes and businesses experience this transition, so too does community and culture. This is certainly true of Woodstock, one of the leading case studies of urban renewal in South Africa. A ‘grey zone’ in the apartheid-devised ‘Group Areas Act’, Woodstock is a place where white, African, and coloured people once found work, lived and called home. Much has changed since its gentrification. 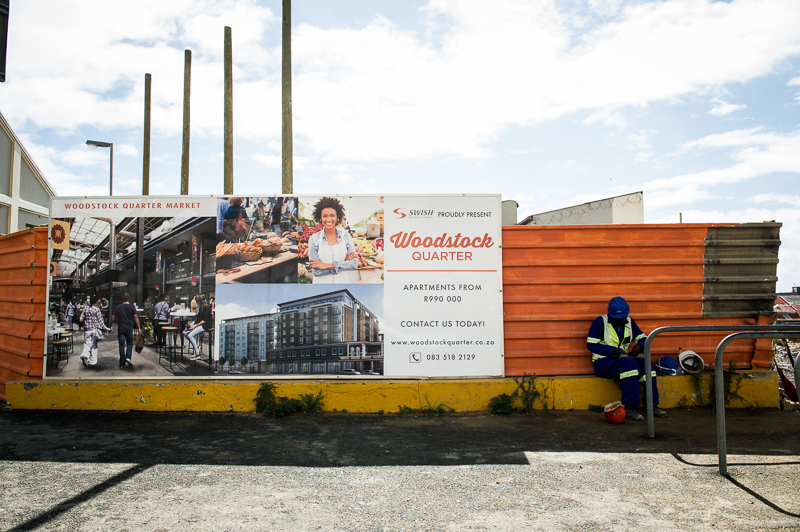 With the introduction of a new class of businesses and the shift towards a ‘service economy’, Woodstock has turned into a tourist hotspot, a housing market with immense investment potential, a creative incubator, and a hub for Cape Town’s artisanal fraternity. This has attracted a new class of people, both permanent and temporary, which is gradually replacing its existing community through the forces of the free market. Gentrification is best understood as a process of change. It is both the physical and cultural transition of a neighbourhood from one that has the characteristics of high crime rates, low property values, and low household incomes, to one that has low crime rates, high property values, high incomes, and burgeoning economic activity. This transition is the result of the physical movement of people from high-income areas to low-income areas, and the changes that they bring with them. This can be summed up as the out-migration of poverty, and the in-migration of wealth, and the subsequent changes that follow new money. Whether this change is good or bad for the existing community could define gentrification’s status as a positive force for economic development, or a perpetuation of white privilege and exclusivity. On the one hand, various investments in the community can be beneficial for established residents, as they could potentially have access to improved services. Moreover, residents could have access to new social connections and economic capital that demands improved service delivery. However, the drawbacks could far outweigh the advantages of change. If not managed properly, urban development can lead to a dramatic increase in rent and property tax, forced eviction, displacement, and social discohesion that will see residents unable to afford access to these benefits, which will result in a gradual out-migration to more affordable neighbourhoods. This benefits the gentrifiers at the expense of the gentrified. The question “what is gentrification?” will not find answers easily. Gentrification is a hazy, ambiguous concept that lacks a true definition. And something that is hard to define, is often hard to measure. Gentrification is typically measured by studying the growth of certain indicators over time, be they a rise in median income levels, for example. I posit a new way of measuring, or identifying gentrifying areas, with what I refer to as a ‘Gentrification Equation’. The equation, in its simplest form, should be read as “X + Y = gentrification”. Here, “X” or “Y” refers to a particular indicator. This would serve to make the process of discovering gentrifying areas all the easier, if the equation could work that way. Of course, no such equation exists, but researchers have conformed to a standard set of indicators to identify or confirm gentrification, to some degree of accuracy. However, none have proven conclusive in establishing an agreeable method of making these discoveries. The closest form of an equation is formed by the use of ‘key variables’ which measure gentrification. Traditional variables make use of census data and include changes in median income levels, racial composition, and crime levels. When measured over time, a rapid increase in the value of one or more of these variables in conjunction with another would indicate ongoing gentrification in a neighbourhood. In their 2003 study on gentrification in US cities, researchers Raphael Bostic and Richard Martin established that neighbourhoods whose median income levels rose from less than 50 percent of the metropolitan median, to more than 50 percent of it, could be positively identified as undergoing gentrification. Many studies have replicated this method, and have included additional variables in the equation. Yet questions remain over its ability to differentiate between instances of gentrification and economic development. Does an increase in median income levels tell a story of gentrification, or is it merely a sign of economic development? Can we deduce from census data that changes in racial composition are indicative of gentrification, or are they simply attributable to social displacement? The ‘Gentrification Equation’ posits two indicators, namely coffee shops and property values. The equation hypothesizes that gentrifying neighbourhoods will have both high coffee shop density as well as high property value increases over time. One of gentrification’s most ubiquitous symbols is the emergence of a new service economy, which takes the form of trendy coffee shops, antique shops, art galleries, and restaurants. This economy caters to a new class of residents, one with deeper pockets and more ornate lifestyles. The emergence of coffee shops have been identified as one of the most prominent signs of the forthcoming economic and social refashioning of gentrifying neighbourhoods. What is significant about the sprawl of these new businesses, as opposed to standard indicators of change, is that it shows a different side to gentrification; one where not only is economic and racial change present, but also a lifestyle change as the neighbourhood is fashioned in the image of its new inhabitants. Coffee shops, in particular, hold special significance as the most prominent symbol of neighbourhood change. Some studies suggest there exists a relationship between a neighbourhood’s average property value and the density of coffee shops in that neighbourhood, although obviously this relationship is not causal. When trying to identify gentrifying areas, it becomes a useful measure to count the number of coffee shops within each neighbourhood, to ascertain its status as a potentially gentrifying one. As pictured in the map, coffee culture is widespread across most of Cape Town and its surrounding suburbs. 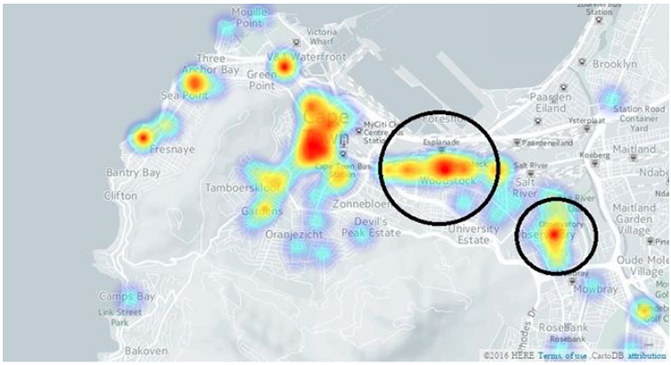 The heatmap shows high density zones of coffee shops around Cape Town. There are seven neighbourhoods showing a high density of coffee shops: Cape Town CBD, Gardens, Fresnaye, Green Point, Sea Point, Woodstock, and Observatory. While these may all be hot spots for coffee goers, they certainly are not all gentrifying. 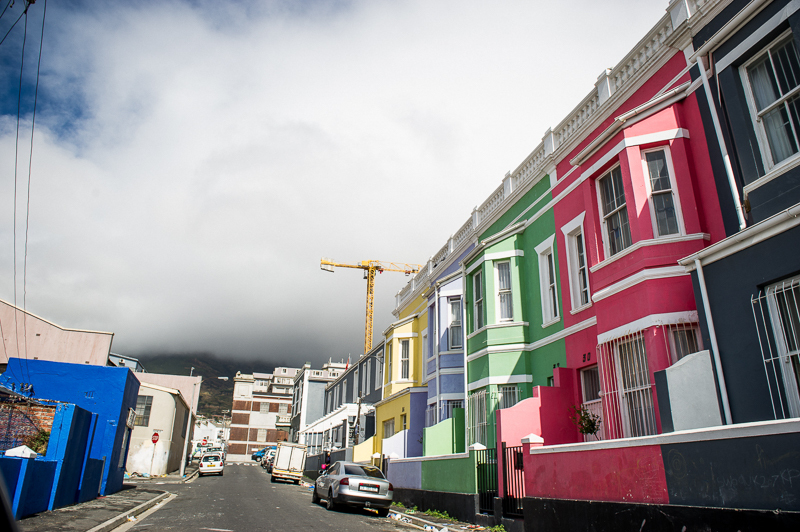 Gardens, Fresnaye, Green Point, Sea Point, and Cape Town Centre, are established high-income areas, ruling them out as potentially gentrifying. Woodstock and Observatory can be argued to be potentially gentrifying, with Salt River having little to no coffee culture. Salt River smelling the coffee: Woodstock and Observatory flank Salt River as high-density coffee shop zones. While the emergence of coffee shops are indicative of change, most change in gentrifying neighbourhoods is geared towards the beautification of the new surroundings. One way of seeing this change is in the renovation of houses. Incoming residents snap up homes at a relative bargain, and seek to refurbish them with the aim of living there or to flip them for their resale value. Soon enough, the neighbourhood starts changing in appearance. Old, neglected houses are gradually replaced by modern double-stories, and the neighbourhood takes the look and feel of a fresh, up-and-coming area ripe with investment potential. Gentrification is typically associated with a rise in property values. As properties get bought and sold, and the neighbourhood bustles with new business activity, property values shoot through the roof. Within a few years, homeowners can make large windfalls from property sales. Thus it becomes a good measure of gentrification to study the growth in average property values per neighbourhood. Neighbourhoods experiencing exceptionally high growth rates over time, along with high coffee shop density, could hint at ongoing gentrification. The map measures the growth in average property values between 2010 and 2014. The property inflation map shows neighbourhoods with the highest increases in property growth between 2010 and 2014. Darker shades of blue indicate higher growth. 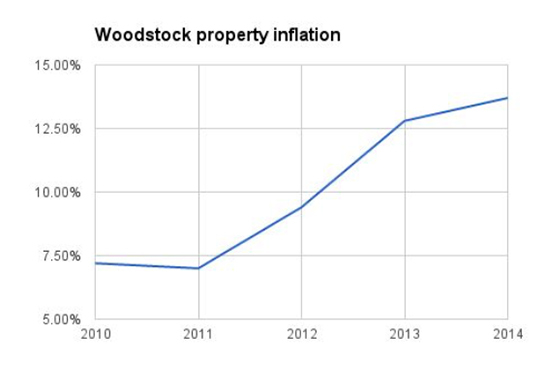 Woodstock is immediately identifiable as an area with skyrocketing property values, with a 36% growth rate. The Cape Town CBD had the lowest growth with 11%. When compared to the spread of coffee shops, certain patterns emerge. It becomes clear that there is a correlation between high density of coffee shops and increasing property values. Both Woodstock and Observatory have the highest increases in property values, as well as high densities of coffee shops. This pattern is replicated in Cape Town CBD, Gardens, Green Point, Sea Point, and Fresnaye. Salt River, despite currently having neither a high density of coffee shops or high property growth rates, is interesting for its potential to be gentrified. Its location makes it somewhat of a peculiar case. It is situated right in the middle of Woodstock and Observatory, two neighbourhoods with rapidly changing economic environments. Moreover, it is boosted by its proximity to the city centre and access by railway, making it ripe for gentrification. Woodstock has already felt the storm. Salt River sits in wait. Woodstock on a weekday is very different to a Saturday morning at the Biscuit Mill. It is the calm before the storm, and the calm is a place of relative quiet. The honking and whirring of cars and taxis passing by are the only audible sounds. Everything else is fairly laid back. Store managers sit outside their shops hoping to entice potential customers, waiters are huddled in conversation inside empty coffee shops, and students mind their own business as they make their way to the nearby Cape Town Creative Academy. Business as usual. ‘The storm’ comes on Saturday, when change is most apparent. The steady flow of cars is replaced by a string of stranded drivers, stuck in place. Traffic is heavy, and moving is slow. Taxis hoot more frequently. There are more customers to shout at. Store managers are on their feet, helping patrons appraise a piece of antique furniture. Waiters are spinning and twisting like tops around the crowded tables of breakfast-havers and coffee-goers. Life is most frenetic at the Biscuit Mill; the pulse of Woodstock. This is the hipster-hub, home to swathes of youthful, trendy twenty-somethings who frequent the Mill on Saturday mornings like hikers to Lion’s Head. It seems like everyone that’s part of Cape Town’s ‘it’ crowd is here today, and the street is a bustling hive of coffee-scented fervour. Diagonally opposite the Biscuit Mill, on the corner of the block, stands a dainty house with an elderly woman sat in front of it. Her name is Lorna Thompson, a long-standing Albert Road resident of 37 years. I had prearranged to meet with her, after hearing about her experiences as an informal business owner selling wooden frames in a rapidly changing environment. Lorna, and others like her, see the opening of the Biscuit Mill as the focal point of all the change in the neighbourhood. But are all changes bad? Have there been any positive sides to gentrification? I enquired about four things: business, property, culture, and crime. Business has not yielded any positive stories. The influx of new people has not done much to help her sustain her business. But what about the rest? It’s easy to mistake gentrification as an opportunity for the locals to cash in on their assets. As an example, a house bought in 2005 with the value of R500, 000 that grows to R2 million in 2015, has seen an increase in value of R1.5 million over 10 years. Owners of the house, in theory, could see quite the profit from selling it. But what is often not understood about this process is that property rates are tied to the value of a property, so owning an expensive house comes with the caveat of dishing out exorbitant taxes on a monthly basis. In most cases, the appreciation of a property’s value is inconsistent with the growth of a household’s income level, forcing homeowners to use an increasingly large portion of their income to pay their rates. This is what is what is referred to as the ‘property curse’. The higher the value of your property, the harder it is to hold on to it. Apparently, owning a property in Woodstock is not as common as you’d expect. There are many families who either live in council-owned houses or are renting. And when it comes time to sell, and rake in a small fortune, it is the landlords that benefit. Considering the fact that Lorna lives right next door to two coffee shops, the possibility of someone buying the property to convert it into a another one is all too real. And if that should happen, the future for Lorna is uncertain. 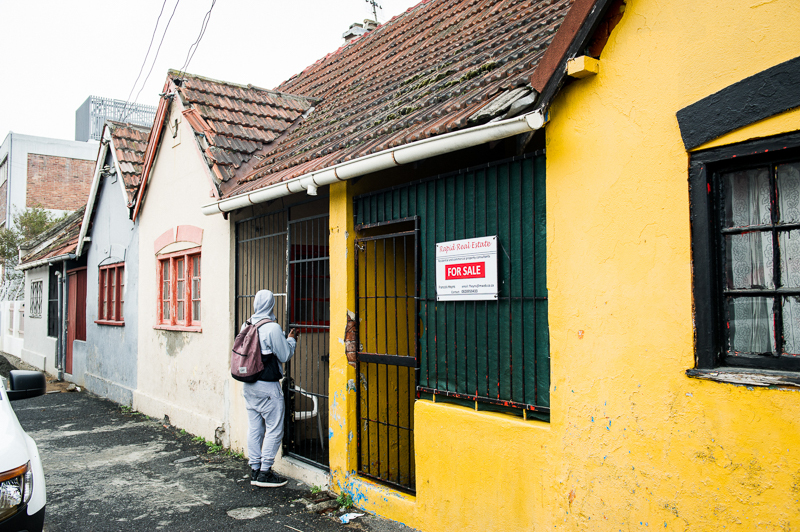 The Western Cape Anti-Eviction Campaign, who have been champions of poor and marginalised communities in the Province, have described this process of gentrification as ‘oppressive’, noting the cruelty of removing long-time residents who cannot afford to live there anymore into makeshift ‘gentrification communities’, or Temporary Relocation Areas, like the infamous Blikkiesdorp. Yet change in Woodstock is most noticeable in what can be described as an ‘architectural imbalance’. Certain buildings just stand out. Like flowers in a field of weeds, their aesthetic and design are out of sync with the rest of the environment. They represent the richness of the soil, and the on-going change to the face of the neighbourhood. 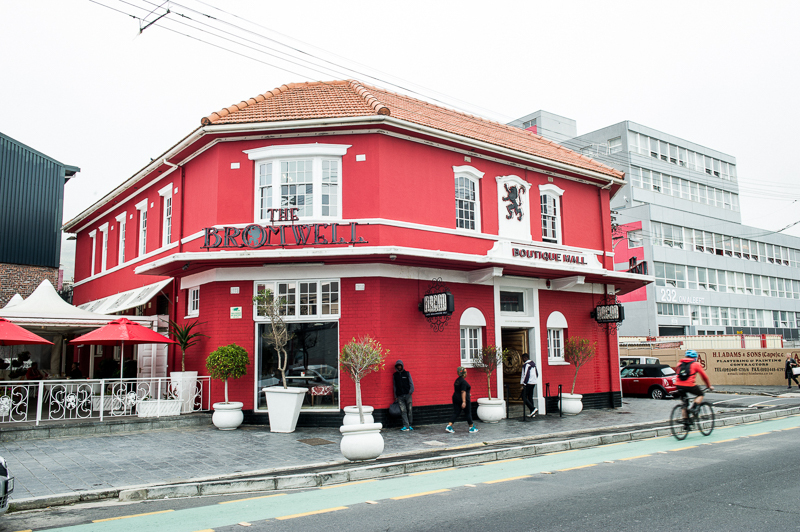 One such building is the Bromwell Boutique Mall. Its website describes it as “a secret gem situated on Albert Road, Woodstock. A luxurious labyrinth of decor, art, literature, and SA fashion.” It is also home to a charming coffee shop called Bread Cafe. The waiter informs me that just a few years ago, I would have been sitting in a brothel; one of many brothels that existed before gentrification. The infamous Gympie Street, further down the road, was notorious for its nightlife attractions, being home to many brothels, bars, and clubs. Today, those same buildings are renovated in blue, pink, and green pastels, and home to renting tourists. Then, of course, come the coffee shops. Coffee shops are to Albert Road what bars are to Long Street. Tribe Coffee, one of the more popular ones, used to be a collection of separate houses. The Woodstock aesthetic can still be seen and felt amid the aroma of coffee beans. As the coffee shop map shows, they are densely concentrated on Albert Road and scatter out towards Main Road. Lorna laments the impact gentrification is having on the Woodstock community and culture. Woodstock has always had a strong sense of community. She says that neighbours were neighbours for life, and everyone looked out for each other’s well being. But when your neighbour is replaced by a coffee shop, any feeling of community that once was, is no more, or is slowly fading. The community is now a community of “outsiders” and “rich people”, who are playing an active role in Woodstock’s cultural disintegration. 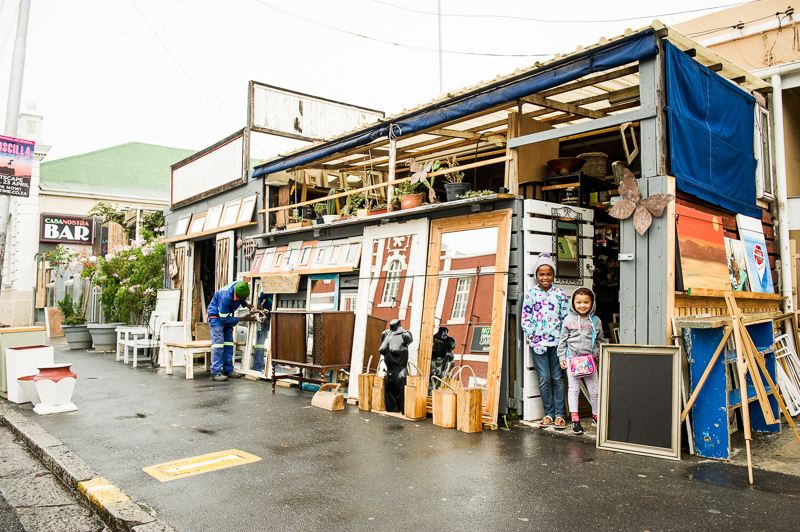 Further down the road, away from the Biscuit Mill, is an antique store with a treasure trove of furniture, lightings, and various architectural items. The store is called Delos Antiques. It first opened in 2010. Before it’s refurbishment it used to be a church school. Despite operating from Woodstock for 6 years, it can still be considered as one of the new kids on the block. The store manager is a woman named Carmen Matthysen, who feels that despite the negative effects gentrification has had on the Woodstock community, it would be remiss to ignore the benefits. Albert Road turns into Malta Road as I stroll onwards into Salt River. As I make my way down the street, changes become apparent. The energy is different. Bustling crowds thin out into streams of ordinary people. Some are window shopping. Some are waiting for a taxi. Some are delivery men restocking the fridges of grocery stores. Some are shop owners stepping outside for a smoke. The buzz of the weekend shoppers, trendy hipsters and wide-eyed tourists fade into the background. This is Salt River. A few years ago, my walk into the neighbouring suburb would have been a seamless transition. But as the locals keep reminding me, this place isn’t what it used to be. Salt River and Woodstock share a similar cultural and economic history. 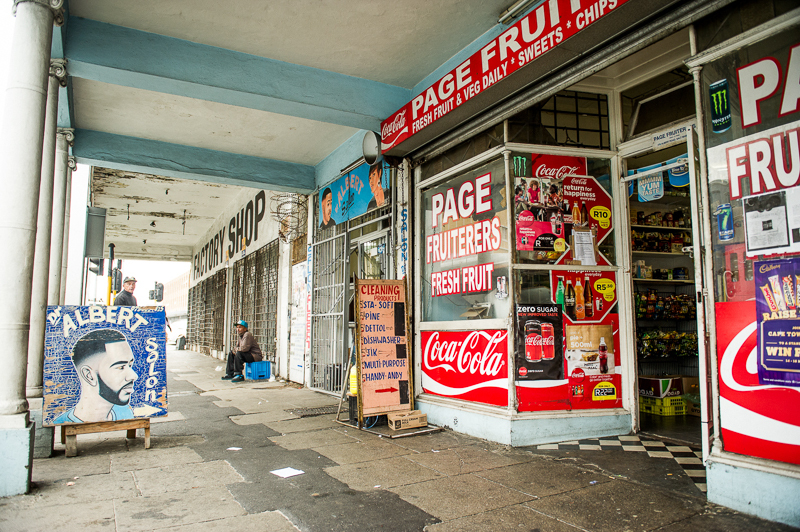 Both neighborhoods are predominantly coloured areas and hubs for Cape Town’s textile industry. Yet you’ll find no hipsters or coffee shops in Salt River. Standing at the edge of the two neighbourhoods feels like being on the hem of history. On the one side is trendy Woodstock, and on the other is what Woodstock used to be. I turn my back towards the future, and start my journey back in time. I enter one of a seemingly endless string of barber shops that line the street like wallpaper. Inside, an old, diminutive man (who has asked to be kept anonymous), masks his curiosity with a welcoming smile. He hasn’t seen me here before, and he knows all of his customers. Every single one. After some polite exchanges, it dawns on him that I did not come here for a haircut. “I wanted to say, you don’t look like you’re from around here,” he says jokingly. “I wanted to charge you extra for a haircut.” I suppose he has a point. My choice of clothing is more suited to the Woodstock clientele. Down the road, I would fit in with the hipsters-of-the-Mill. Here in Salt River, I look like a tourist. This is essentially why I wanted to explore Salt River. It seems like gentrification is an inevitability, given its proximity to the Biscuit Mill. According to Achmat, it’s only a matter of time before he has to pack up and move out of Salt River to somewhere more affordable. When you look at Salt River’s property growth, Achmad’s fears are justified. While growth between 2010 and 2014 is only at 23%, compared to Woodstock’s 36%, Salt River is definitely on an upwards trajectory. Property values are on the incline over the last five years. The cycling lane runs right down Albert Road, into Salt River. Without a definitive timeline, the City of Cape Town plans to implement cycling lanes all over the city. 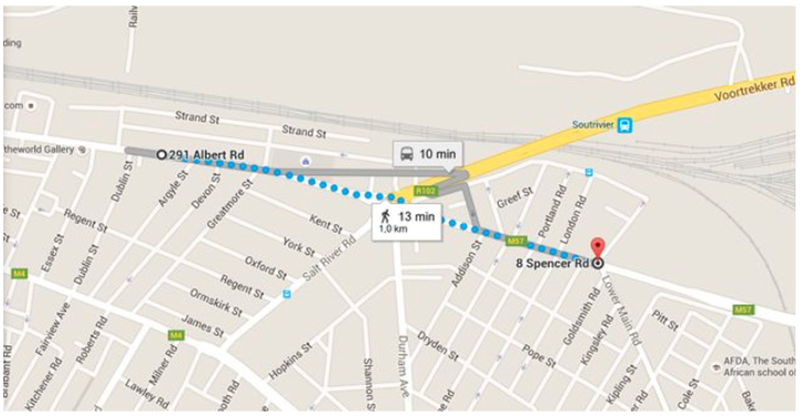 As the map below shows, many more businesses in Salt River and Woodstock are going to have to deal with angry cyclists for years to come. CYCLING HAVEN, PARKING HELL: The City’s proposed cycling network is wide-reaching. On that sober note, I thank Achmat for his time, and make my departure. When businesses can’t afford to pay rent, as is in the case of Woodstock, they are forced to relocate to an area with lower property values. But when the place you are relocating to is on the brink of its own transformation, moving there becomes a case of ‘out of the frying pan, and into the fire’. This is the case with my next stop, which is at a little store not too far away from Achmad’s barber shop. The store is called Budget Alarms, a family-owned business selling custom-made alarms to a low-income market. I first heard about this store while trekking through Woodstock, when an elderly furniture store owner told me about businesses moving out of Woodstock due to rent hikes. When she told me about the “alarm company” that moved just down the road into Salt River, I knew I had to track them down and find out why. Budget Alarms opened its first store in 1981, diagonally opposite where the Biscuit Mill now stands in the heart of Albert Road. At the time Woodstock was home to many a family business. 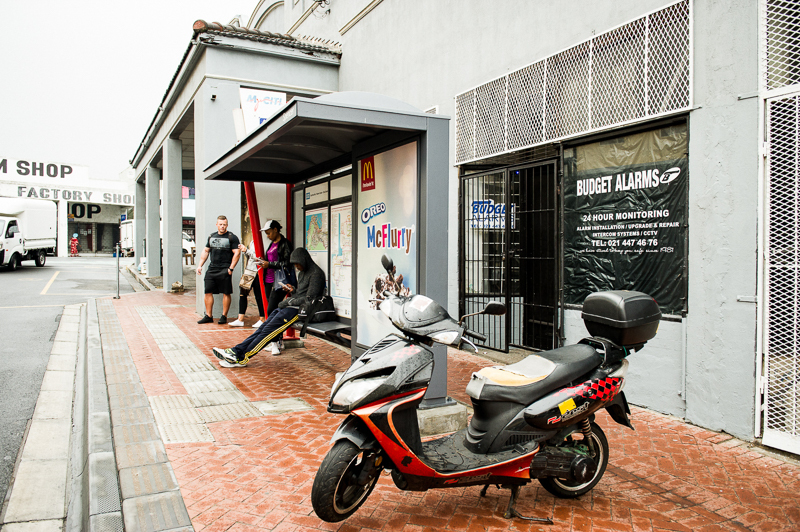 Today, Budget Alarms hides directly behind a MyCiti bus stop on the corner of a run-down Spencer Road, on the outskirts of Salt River, far out of the limelight. Indeed, much has changed. Abu Bakr Albertyn is the store manager. His nephew, the company owner, is not in today. Nevertheless, he invites me in for what I promise would be a quick chat. It certainly should be cheaper. Despite being direct neighbours, Salt River would appear to be much more affordable to live or work in. 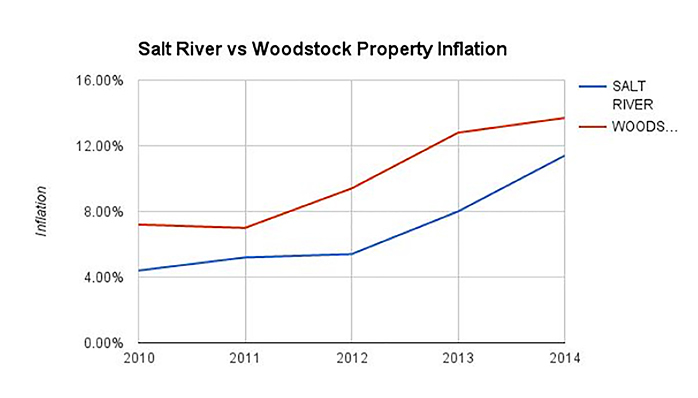 As the data shows, Woodstock has outpaced Salt River in terms of average property growth and should reach similar levels of inflation, according to its trajectory. 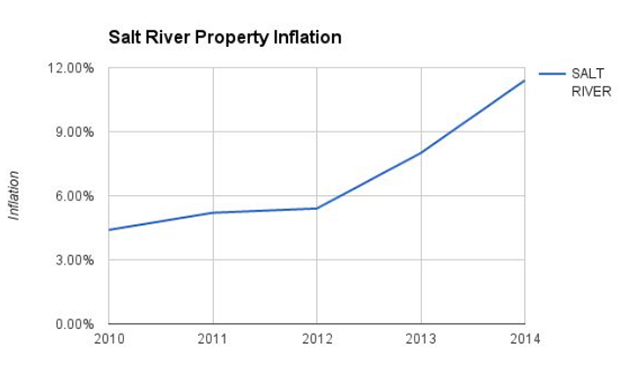 Salt River’s property inflation is on course to reach Woodstock heights. Yet signs of economic development in Salt River are beginning to emerge. New businesses are taking advantage of comparably low property rates and proximity to new economic zones to set up shop, and change is evident. One such example is the new Pals building in Durham Street which has seen major renovations and is now home to companies like BrandsEye, Zando, and Quirk. Companies of such status operating from Salt River shows the outlook businesses have for future growth in the area. For Budget Alarms, the move to Salt River makes financial sense. Businesses like these were simply not designed to operate in the kind of environment Woodstock has become. Yet all does not seem well with the melancholy store manager. “Business isn’t the same as it was. Yes we are paying less to be here, but we also get fewer customers. In Woodstock, we had a big place with a huge sign for our business. It was always busy and people always knew where we were. But Woodstock has changed a lot now”. If I had a rand for every time someone said those words, I still probably couldn’t afford to live in Woodstock. Gentrification is clearly very real for Salt River residents, as they have seen what has happened to their neighbours down the road. Depending on who you speak to, gentrification can either be good for the development of the neighbourhood, or an external force seeking to conquer and cleanse – ‘urban renewal’ seeks to create a better working and living environment, but this renewal is not geared towards inclusivity. New business owners see gentrification as a force for liberation. They see gentrification as a mutually beneficial force, but with obvious consequences that are out of their control. Yet long-time business owners and residents see liberators as invaders. While beautification, employment, security, and diversity are generally viewed as benefits, it is the question of access to these benefits that is the deal-breaker. The Woodstock establishment, as well as Salt River, do not feel that they are part of the grand plans for the future. The future of their communities are falsely advertised to them. They can neither afford nor are made to feel welcome at these new establishments. Gentrification has the potential to benefit the community only if it is inclusive of that community, but that statement is somewhat of a paradox. Exclusivity is at the heart gentrification. The nature of it is that of change. It is a process that seeks to create a living and working environment that caters to a new class of people. This sees the gentrified lose out to the gentrifiers. Woodstock can be seen as a microcosm for South Africa’s vast inequality. In South Africa, class and race have a deterministic relationship and because its history of inequality is drawn along racial lines, race determines class, to a large extent. Naturally, when wealthier people replace the poor, it is situated in a familiar context of race and inequality. Discussions heat up quickly. One is likely to hear words and phrases like “these whites”, “outsiders”, and “foreigners”. They represent what is perceived as a perpetuation of land-grabbing and forced evictions of the past, where the ‘white man’ is coming to steal their land. Through this lens, gentrification cannot be viewed positively. Call it urbanisation, redevelopment, or restoration but to the locals, gentrification will always be met with pessimism and fear. And these fears are justified. This project was produced as part of a Master’s thesis at the University of Cape Town in conjunction with Code for South Africa. Special thanks to Lightstone Property for providing access to property inflation data which helped make this project possible.